Monday’s happycow.net research turned up a cuban place with vegan empanadas. WHAT?!?!? Yes. This is pretty much when I first started to seriously think we could start looking for employment in Orlando. I’m not kidding! This was my dinner that I was only able to eat half of… a container of black bean soup (no rice, per my white rice hating preference), maduros (fried ripe plantains), and 2 vegan empanadas. I was in absolute heaven. I even traded a couple maduros for a couple of Jeremy’s tostones (fried green plaintains) that were made to be dipped in my black bean soup. SO GOOD. 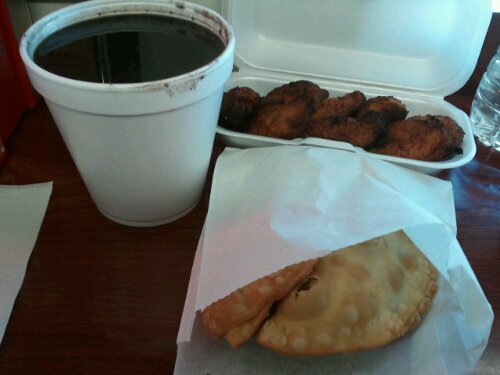 The black bean soup, while being a little salty, was really good, and the platanos were cooked perfectly. The maduros have the right degree of burned cripy edges, and the tostones having the correct crisp outsides and tender middles. Come see why they’ve won best cuban, best latin, and best take-out in Orlando. Black Bean Deli is located at 325 S Orlando Ave (in Winter Park), Orlando Florida 32789. 407-628-0294. Open Monday through Friday 11-8, and Saturdays 11-5. Closed Sundays.